With the help of a $299,998 NSF grant, chemists Joshua Schrier and Alexander Norquist, and computer scientist Sorelle Friedler, will create a database to collect and analyze the results of experimental efforts focused on a class of materials with promising industrial applications. The scientists will be investigating organically templated metal oxide framework compounds, whose properties lend themselves to potential industrial applications such as gas separation, optical engineering, and the development of new catalysts in the chemical industry. Norquist is an expert in synthesizing these materials, and he and the Haverford students in his lab have created a host of compounds over the past decade. But the process requires that researchers conduct many, many individual experiments, and, since most of the chemical reactions performed do not result in the formation of new unique compounds, they cannot be reported in the literature. However, these experiments provide valuable information about what doesn't work, which could lead to the development of techniques that will. 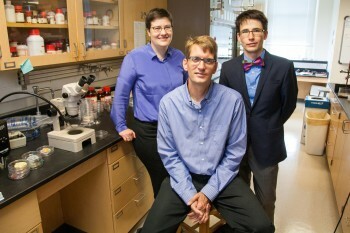 To bring all of that information together, Schrier, Norquist and Friedler will use their NSF funding to support the creation of an online database to collect the previously unreported experimental resultsâ€”which they call“dark reactions”â€” observed by Norquist and by many other scientists working with the compounds. The team will also use this data as a resource to train machine learning algorithms (also known as statistical learning or data-mining) to predict the success of reactions ahead of time and recommend successful experiments. Finally, they will perform experiments to test the predictions produced by the model. Haverford students play a key role in the project: Casey Falk â€˜16 has developed an initial version of the database. Paul Raccuglia â€˜14 developed an initial version of the machine learning model. Geoffrey Martin-Noble â€˜16 and David Reilley â€˜16 entered reactions from old laboratory notebooks. Yunwen (Helen) Yang â€˜15, Yongjia (Scott) Huang â€˜15 and Katherine Elbert â€˜14 are currently working on testing the predictions experimentally. “Our project will provide a mechanism for collecting the dark reactions and then using them to guide future reactions to be more successful, reducing the researcher time and cost of reagents needed to synthesize new materials,” says Schrier, who observes that the project directly addresses the call of the White House Office of Science and Technology Policy's Materials Genome Initiative, which challenges scientists to find ways to use computation to bring functional materials to market more quickly. The project will provide sustained interdisciplinary research experience for Haverford students, and Schrier, Norquist and Friedler hope that their computer science/chemistry collaboration will be a model that can be replicated in other disciplines. The Haverford scientists also plan to conduct outreach activities to foster interest in data-driven techniques, create a network of collaborating laboratories and provide the software infrastructure so that other researchers can initiate related projects.